What do you have when you combine mowers, paint, augers, zip ties, bird nets, round-up, buckets, shovels, mulch, edu cational signs, public radio, scientific research, natural resource agencies, a supportive city government, plus local citizen and student volunteers? You have an incredibly powerful force for change! What kind of change? 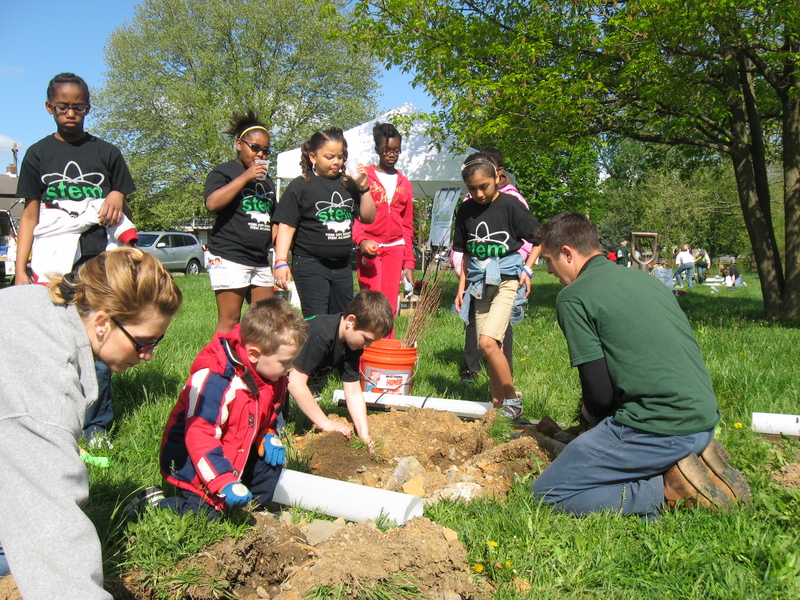 Tree planting to revitalize urban communities across the Keystone State. WITF public radio station invited volunteers to come out on Saturday, April 30, 2011 to plant trees along an urban stream. Treevitalize, organized the plantings in concert with local agencies, in this case, the City of York and the York County Conservation District. Founded in 2004 b y the Pennsylvania Department of Conservation & Natural Resources (DCNR), Treevitalize is the Commonwealth’s premier tree planting and citizen education program. 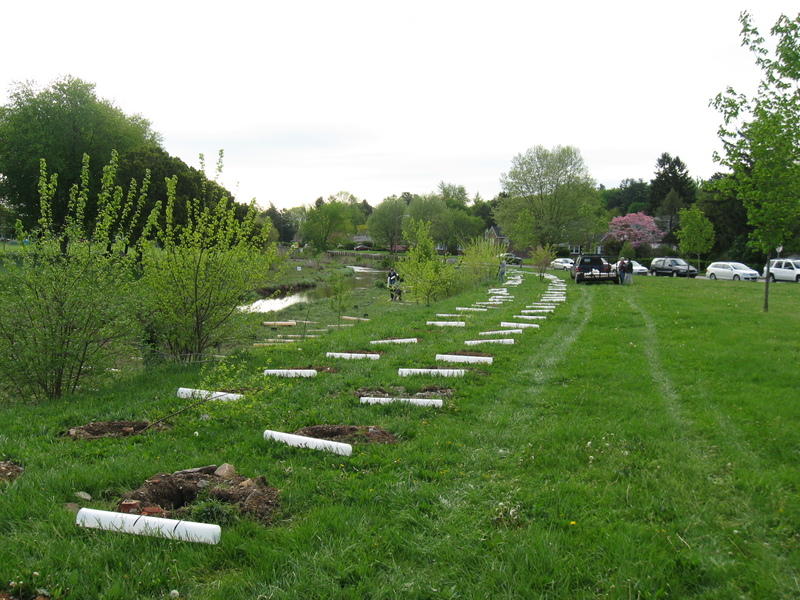 Its goal is to plant 1 million trees by 2012 - both large caliper street trees and saplings in urban riparian zones throughout Pennsylvania. Perhaps more importantly, Treevitalize seeks to train 10,000 volunteers in basic tree care so they can lead additional plantings in their communities. The vision of TreeVitalize is ultimately to establish strong urban forestry partnerships in all 14 Pennsylvania metropolitan areas while building local capacity to sustain and enlarge urban forests. What was the genesis of all this vital energy? Knowledge and creativity. In 2003, an analysis of the Delaware Valley urban ecosystem found that a 5-county region around Philadelphia had lost 8% of its heavy tree cover over a period of just 15 years. As many people know intuitively, urban trees contribute to quality of life and economic value in neighborhoods. What science has quantified in recent years is the essential services they provide, even within cities, through absorption of precipitation runoff and capture of pollutants, including the greenhouse gas carbon dioxide. The study estimated that Philadelphia’s tree loss translated into an additional 53 million cubic feet annually of storm water runoff, costing $105 million, as well as reduced absorption of 1.7 million pounds of pollutants, a $3.9 million service. The lost trees also meant the loss of 1,373 tons of carbon sequestration, which leaves that much more greenhouse gas in the atmosphere. DCNR’s Treevitalize partnership with radio stations began with a simple question. In response to a central Pennsylvania public radio tree-planting incentive - for tree-planting in California - the folks at DCNR wondered, why not here in Pennsylvania? 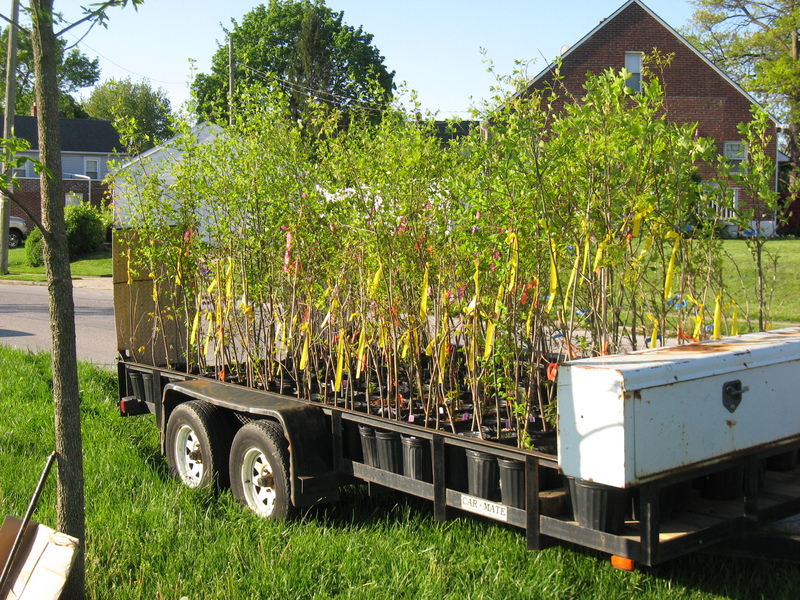 From that seed of a question grew the Treevitalize program, in which Pennsylvania radio stations provide an incentive for station membership while providing free PR for DCNR’s local conservation efforts, including recruitment of community tree-planting volunteers. From an initial state grant of $3 million, millions more have been contributed by the US Forest Service, and private corporations and foundations - including Aqua PA, the Philadelphia Eagles, PECO/Exelon and the William Penn Foundation. The initial partnership with WITF radio has expanded to WDIY Allentown, WHYY Philadelphia, and WQED Pittsburgh. 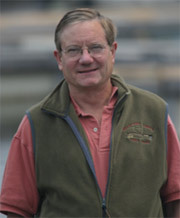 Over 230,000 trees have been planted as of April 2011. It has become a showcase for DCNR's goals to "Build and maintain sustainable and attractive communities" and to "Create outdoor connections for citizens and visitors." So what happened in York on April 30th? WITF radio succeeded in getting its members to donate $2,380 toward the York tree planting, matched by funds from Treevitalize. York is the fourth "WITF Woodland" project the radio station has sponsored. 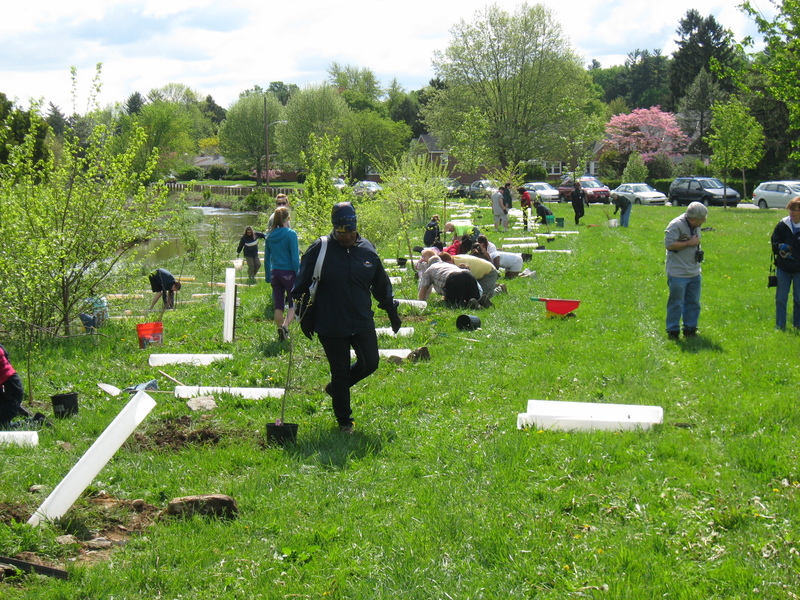 The morning of the planting, more than 75 volunteers turned out to plant 680 saplings of a dozen native tree and shrub species along Willis Run. The stream is a tributary to Kiwanis Lake, a city bird sanctuary visited by Black Crowned Night Herons. Volunteers arrived to find planting holes already dug, free from weeds, accompanied by plastic tubes to protect young trees from heavy equipment. Organizers had neatly laid out a design that allows for mowing between seedlings - an important means of reducing weed competition in the trees‘ early years.